Beginning March 1, 2015 the motion picture Styria aka Curse of Styria aka Angels of Darkness will begin airing on Showtime Cable. This most recent major film adaptation of Joseph Sheridan LeFanu’s gothic classic Carmilla has been in the works for several years and vampires.com has been covering it for nearly as long! We even published a three-part interview with writer-director Mark Devendorf (his co-writer-director was Mauricio Chernovetsky). The production company organized a crowd-funding campaign to finish post-production, eventually exceeding their goal. In essence, this adaptation of what is in many ways the very first story of lesbian vampires eschewed fangs and ripped bodices for more disturbing, nightmarish fare. Resetting the tale into not-quite-modern times, the film takes place in the 1980s behind the Iron Curtain. This parallels the original, because Austria was widely seen as a police state for readers in 1872. Lara, the lead (played by Eleanor Tomlinson who’s gone on to co-star in The White Queen as well “The Labours of Hercules” for Poirot), has just been expelled from boarding school. We never learn precisely why, a nice touch in keeping with the overall atmosphere of mystery. Her father must take her therefore with him on an expedition for which he has been years planning. 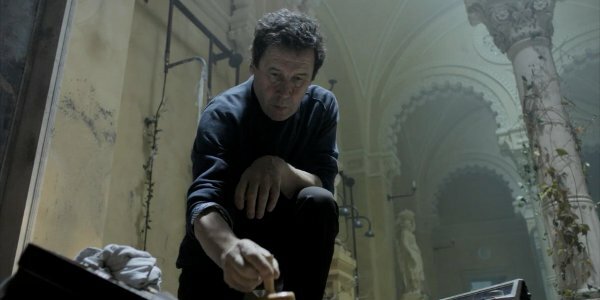 Professor Hill (Stephen Rea, best known perhaps for Interview With the Vampire as well as V for Vendetta and of course The Crying Game) intends to save a series of murals painted many decades past in the old Karnstein Castle. Estranged father and daughter almost immediately run afoul of locals, in a variety of ways. Yet in truth they cannot or will not turn to one another. Enter Carmilla (Julia Pietrucha), a secretive local girl fleeing the secret police who becomes a friend and confidante, maybe more to the desperately lonely Lara. Soon events begin taking a bizarre turn. Local young women begin going mad, then committing suicide in clusters. Villagers look upon the strangers–Lara and her father–with blame. Lara herself finds a hitherto-unknown mural, while more secrets slowly reveal themselves about this place and this time. Carmilla proves to be not at all what any of us (including the audience) might think. Unspoken truths emerge between father and daughter. Fears and hopes bleed into one another while reality itself seems to shimmer into something else. Now the film is available on both Amazon and on iTunes. Likewise Monolith Films will be releasing the motion picture in Poland soon (many of the supporting players were Polish actors). This marks one of several different versions of Carmilla to have emerged in the last four years. Frankly this and others seem to mark a new direction in the wave of vampire media, a more mature and disturbing, less easy-going or fun-loving approach to the idea of the living dead who drink the blood of the living. More, the filmmakers explicitly sought to explore the idea of feminine power repressed. Having seen the film, allow me to say for the record this enjoys truly superior performances by the entire cast. The visuals remain eerily beautiful, often startling in composition. Location shooting at a gorgeous Hungarian castle certainly helped a lot. Most of all, the script treated its subject matter with total seriousness. Exploitive, no. Fascinating and disturbing? Very much yes. Both screenwriters delved into the very heart of what the “gothic” was all about–inherited evil, dark desires, a blur between the real, the lie and dream, coupled with the kind of intense passion the very young adults (what we today call teenagers) feel about the world. A very good review of this movie. I’ve watched it twice, discovered things in the second viewing that I missed the first time, and assumptions that I had made were pulled out from under me. Psychologically complex, this movie delivers the right amount of Gothic atmosphere, mystery, and horror. Highly recommended.